Left suddenly penniless, the Honorable Sophia Grafton, a viscount’s orphaned daughter, sails to the New World to claim the only property left to her name: a tobacco plantation in the remote wilds of colonial Virginia. Enlisting the reluctant assistance of a handsome young French spy—at gunpoint— she gathers an unlikely group of escaped slaves and indentured servants, each seeking their own safe haven in the untamed New World. What follows will test her courage and that of her companions as they struggle to survive a journey deep into a hostile wilderness and eventually forge a community of homesteads and deep bonds that will unite them for generations. 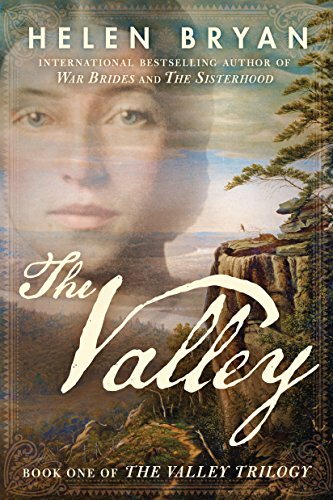 The first installment in an epic historical trilogy by Helen Bryan, the bestselling author of War Bridesand The Sisterhood, The Valley is a sweeping, unforgettable tale of hardship, tenacity, love, and heartache. After the death of her father, Sophia Grafton, inherits the estate of her father, who is an English lord. Before he died, her father invested heavily in a tobacco plantation in a remote loction in Virgina which ultimately ruined him financially. Penniless, except for the plantation, Sophie must travel to the New World to try to start her life anew and make a go of the plantation. She meets a French spy named Henri, a rogue, and she persuades him to work with her and help restore the plantation. The New World is full of hardship, struggle, hunger, danger, and wilderness. Over the years, Sophie manages to get by, although it was never easy. I liked this novel. It's a long read, at over 600 pages, but the characters were highly developed and multi-faceted. They were constantly evolving, adapting, and courageous, behaving in ways that often surprised me. Sometimes the pacing slowed or rushed, but the tale fascinated all the same. Very entertaining! I received a free copy of this book in exchange for an honest review. Thank you for visiting my blog, http://greathistoricals.blogspot.ca, where the greatest historical fiction is reviewed! For fascinating women of history bios and women's fiction please visit http://www.historyandwomen.com.